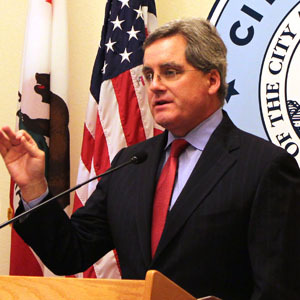 City Attorney Dennis Herrera applauded a federal judge’s decision rejecting the arguments of online rental platforms Airbnb and Homeaway. SAN FRANCISCO (Nov. 8, 2016) — A federal judge today rejected the arguments of online rental platforms Airbnb and HomeAway, who had sued San Francisco to invalidate the city’s law regulating short term rentals. In his ruling, Judge James Donato of the U.S. District Court for the Northern District of California rejected Airbnb and HomeAway’s argument that the city’s law violates the Communications Decency Act and the First Amendment. Donato upheld the city’s law, which is designed to protect the available housing supply by holding rental platform companies accountable for violating San Francisco’s short-term rental rules. Airbnb and HomeAway had sued the city and sought a preliminary injunction – a court order barring San Francisco from enforcing its short-term rental law while the case is decided. In an 18-page ruling, Judge Donato denied the companies’ request, finding that they “have not demonstrated a likelihood of success” in court on the primary grounds they put forth. The judge noted, though, that the mechanism for “prompt and effective registration verification” is not yet in place for seamless enforcement of the law, and so he requested additional legal briefings on that point. San Francisco has voluntarily agreed to not enforce the law pending Donato’s ruling, and will continue to do so as the final mechanisms for enforcement are ironed out. A status conference is set for Thursday, Nov. 17 to prepare briefings on establishing an acceptable verification system to begin enforcement. San Francisco requires those providing short-term rentals to register with the city, obtain a business license and comply with limits on the number of days per year the property can be rented. The rules are designed to strike a balance, allowing residents to supplement their income through renting out a spare room or their home during vacation while preventing the city’s precious housing stock from being turned into de facto hotels. San Francisco’s short-term rental law provides for online hosting platforms like Airbnb and HomeAway to face penalties, including fines of up to $1,000 for each illegal booking transaction, if they provide booking services and receive a fee for an illegal short-term rental. Airbnb and HomeAway sued to invalidate the parts of the law that make the hosting platforms responsible for their booking transactions, and they sought a preliminary injunction to prevent San Francisco from enforcing the law against them. The case is Airbnb, Inc. v. City and County of San Francisco, U.S. District Court for the Northern District of California, Case No. 3:16-CV-03615, filed June 27, 2016.